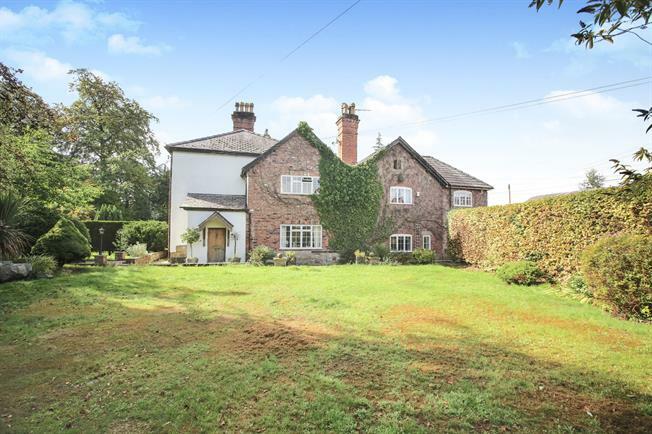 4 Bedroom Semi Detached House For Sale in Nether Alderley for Guide Price £1,100,000. Set in an outstanding, private location Haewood Chase is a four double bedroom period home of grand proportions that forms part of the exclusive Haewood Hall (once the home of the Beckhams). This is a rare opportunity to purchase a stunning residence that would benefit from some refurbishment, where it's period features are abundant and include original cornices, exposed timbers, handsome fireplaces, deep skirtings and high ceilings. Externally the property is approached via a long private road, surrounded by fields. There is a private driveway to the front of Heawood Chase with a turning circle and sizeable, attractive mature private gardens. A second driveway leads to the converted double garage which offers accommodation above. Internally the ground floor accommodation boasts an entrance porch leading into the stunning drawing room with it's open Inglenook fireplace with original brickwork and exposed timbers. A hallway leads to the living room and generous open plan living and dining kitchen with a formal dining room off. The first floor rooms are accessed from the stunning galleried landing with skylight above and original exposed timbers. There are four generous double bedrooms, the master having a beautiful ensuite bathroom. The guest bedroom is also ensuite with bedrooms three and four being served by the family bathroom.